Ecocoast was contracted to create a beach at The Desert Islands, Anantara Resort and Spa in Abu Dhabi. The Desert Islands, Anantara Resort and Spa is situated on the exposed northern side of Sir Bani Yas Island surrounded by a flat rocky reef. Due to its location, previous attempts to create a beach for hotel guests had been unsuccessful and waves were regularly breaking onto the gabion retaining wall protecting the pool. To provide protection, plans were initially drawn up to create a rock fringing breakwater that would have been fully emerged and had significant impact on the natural reef and obscured the ocean view for the guests. 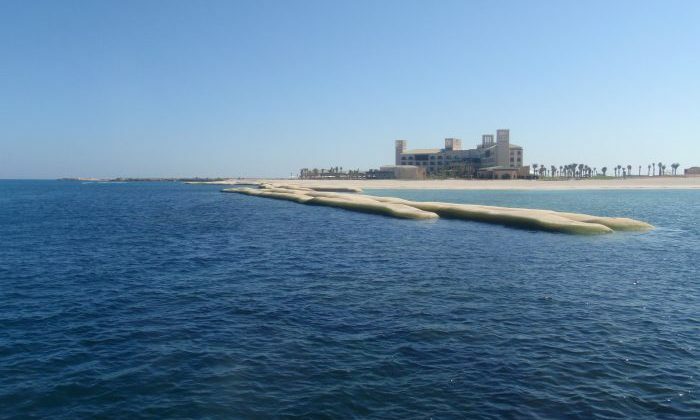 Ecocoast was requested to provide an alternative solution, which consisted of a low crested segmented breakwater created from sand-filled geosynthetic containers. The design consisted of over 80 containers, each 25m long and weighing in excess of 300 tonnes. In keeping with the island’s eco ideology, local sand was used to fill the geosynthetic containers, avoiding the need to quarry rock then transport it hundreds of kilometres. An alternative to a larger rock breakwater, the use of geosynthetic containers provides numerous benefits. The primary advantage is a reduced footprint, which avoids sensitive hamour habitat areas off the hotel’s coast. The inherent softness of the structure also provides a safer experience for beach users and the natural colouring and organic forms of the containers provide lower visual impact on the environment. The previously exposed rocky barren foreshore of Anantara Sir Bani Yas Island Hotel & Spa has been transformed into a sandy beach protected by an eco-friendly reef in-line with Sir Bani Yas Island’s ethos of conservation and preservation. This uniquely designed low-crested reef mimics natural fringing reefs, which break waves offshore and protect the beach. Initial monitoring shows the structure is already providing a substrate for algae and a habitat for fish and crustaceans.